Kintavar Exploration Inc. (the "Corporation" or "Kintavar") (TSX VENTURE:KTR), is pleased to announce assays from channel sampling at the Sherlock and Watson-3 showings on the Mitchi property in Quebec. The mineralized corridor that was identified in September (see press release September 26, 2017) is now confirmed with these continuous composite channel samples and with the historical drill holes from 1972. A grab sample returned 0.74% Cu and 9.74 g/t Ag 200 m east of Sherlock indicating that the mineralization is continuous to the east as shown by the geophysical Induced Polarization (IP) anomaly. The Sherlock and Watson-3 trenches are separated by 70 m and the mineralized lithological units are still open in all the directions and will be tested by a drilling program in the coming months. Details of the private placement can be seen below. The Sherlock trench delivered the widest interval of mineralization identified on the Mitchi property to date with 21.4m @ 0.49% Cu and 5.5 g/t Ag (0.54% CuEq) including 12 m @ 0.64% Cu and 7.4 g/t Ag (0.70% CuEq). Sherlock mineralization is associated with the diopside marble and the diopside rich sediments enriched in bornite and chalcopyrite. 200 m east of the Sherlock showing, a grab sample from an outcrop returned 0.74% Cu and 9.74 g/t Ag. Both coincide with a 450m long weak IP and moderate soil anomaly. The Watson-3 trench, is associated with a moderate IP and strong soil anomaly. 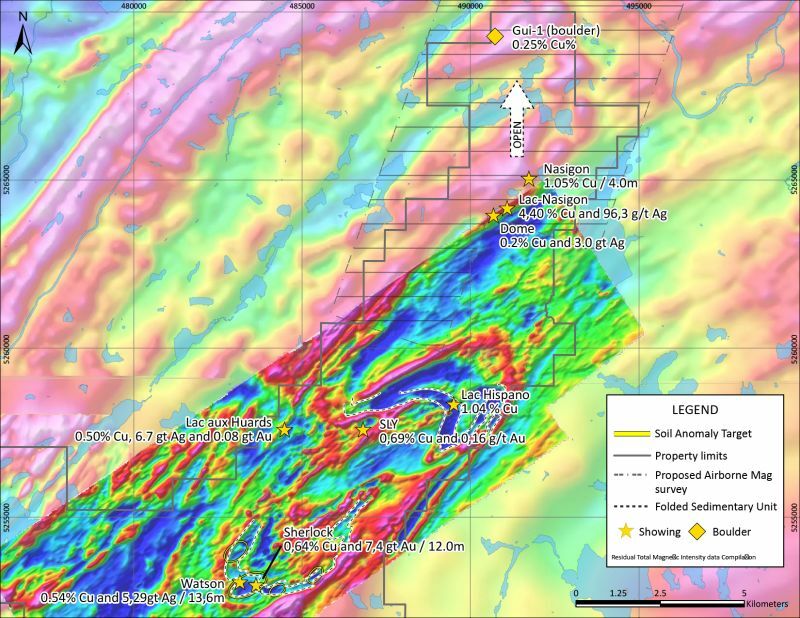 It is located 70 m south of the Sherlock trench and returned 0.59% Cu and 4.94 g/t Ag (0.63% CuEq) over 1.9m and 0.38% Cu and 3.0 g/t Ag over 3.4 m. Watson-3 showing is interpreted as the extension on surface of the mineralization that was intersected in the 1972 historical drill holes (SIGÉOM: GM 27421) DDH12 (0.41% Cu and 16.17 g/t Ag over 6.10 m from 16.4 m), DDH13 (0.49% Cu and 15.26 g/t Ag over 9.75 m from 20.0 m) and DDH14 (0.47% Cu and 11.38 g/t Ag over 3.05 m from 20.4 m). Watson-3 mineralization is primarily associated with the phlogopite rich glimmerite layer and the diopside marble enriched in bornite with traces of chalcopyrite, chalcocite and covelite. A third and southernmost IP moderate anomaly (150 m south of Watson-3) has not been yet explained on surface or in historical drill holes. Michel Gauthier, P.Geo and Ph.D, a technical advisor of the Corporation and a renowned metallogenist and specialist in mining exploration has visited the Watson, Watson-3, Sherlock and Nasigon showings. His interpretation supports that we are dealing with a sediment-hosted stratiform copper (SSC) system in a Grenville setting that underwent high grade metamorphism and folding. "We are very encouraged by the width of the mineralization on surface at the Sherlock area and the potential extension of the mineralization intersected in the historical drill holes and at Watson-3. 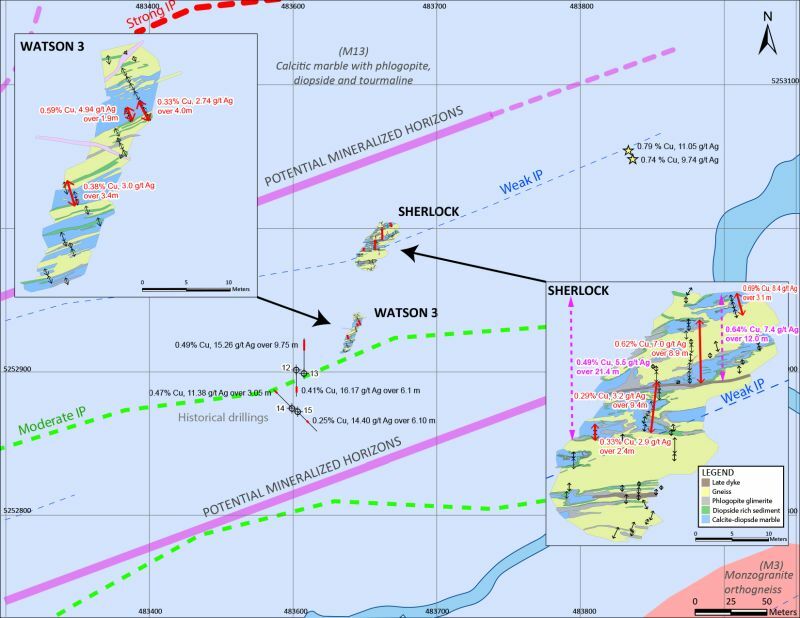 We are dealing with a significant mineralized corridor (potential of 450 m long by 200 m wide) with consistent mineralization identified between the Watson and Sherlock showings. Another positive point is the major color and competency contrast between the mineralized lithologies and the encasing gneiss which is a major advantage for potentially mining this type of mineralized material. The upcoming drilling program will test the depth potential of the mineralization and the lateral extent of each of the zones identified to date. Another important question to be answered is if the IP anomalies are three (3) individual mineralized zones or if they are connected through lower grade mineralization. This will be a major plus in terms of increasing the potential mineralized envelope between Sherlock and Watson-3. We are very excited to be moving forward with the first drilling program on Mitchi in the coming months." commented Kiril Mugerman, President and CEO of Kintavar Exploration. Figure 1: Sherlock and Watson 3 trenches Full size map can be viewed here. 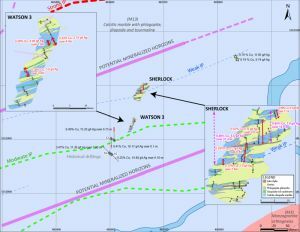 Taking into consideration the SSC system that has been identified, re-interpretation of the geophysical survey suggests an extension of the favorable structure and lithologies 2 km to the east and west of Sherlock and Watson and this is supported by several soil anomalies. Furthermore, the same structure and lithologies are repeated 7 km to the NE as confirmed by the Hispano and Sly showings. The same lithologies and mineralization is then again repeated 6 km to the NNE, as confirmed by the Nasigon showing, but the airborne geophysical survey stops just short of this target area. The Nasigon area is unique in that the mineralization is mainly associated with chalcocite (approximately 80% copper by weight) and highest grades of copper (channel samples from 2014 returned 1.05% Cu over 4.0 m and 2.79% Cu over 1.6 m and are still open in both directions). Figure 2: Regional map with re-interpretation of the airborne magnetics survey Full size map can be viewed here. The Corporation also announces a non-brokered private placement financing (the "Offering") at a modified pricing relative to that announced in the August 29, 2017 press release due to market conditions. The Offering consists of up to 2,272,727 units (each a "Unit") at a price of $0.11 per Unit and 3,571,428 common shares on a flow-through basis (each a "FT Share") at a price of $0.14 per FT Share for aggregate gross proceeds of up to $750,000. Each Unit will consist of one common share (each a "Share") and one-half of one share purchase warrant (each whole being, a "Warrant"). Each Warrant entitles the holder thereof to acquire one additional Share at a price of $0.14 per Share for a period of twenty-four (24) months from the closing date. Closing of the Offering is expected to occur in November 2017 and is subject to receipt of regulatory approvals, including the approval of the TSX Venture Exchange. The securities to be issued under the Offering will have a hold period of four months and one day from their issue. Net proceeds from the Offering will be used for surface work and drilling on the Mitchi property as well as for general corporate and working capital purposes. The Offering will be completed with "accredited investors" under National Instrument 45-106 - Prospectus Exemptions ("NI 45-106") and with existing security holders under Regulation 45-513 - Prospectus Exemption for Distribution to Existing Security Holders, as well as Ontario Securities Commission Rule 45-501 - Ontario Prospectus and Registration Exemptions (the "Existing Shareholder Exemption"). The Offering under the Existing Shareholder Exemption is being made to existing security holders who held shares of the Corporation as of October 16, 2017 (the "record date"). In the event that the Offering is oversubscribed, the Corporation may increase the size of the Offering or allocate subscriptions on a pro rata basis in accordance with holdings of existing shareholders as of the record date. All samples have been sent and prepared (PREP-31) by ALS Global laboratory in Val-d'Or. A portion of the pulp of each sample was analyzed at the laboratory in Val-d'Or for gold by standard fire assay (AU-AA23) followed by gravimetry (AU-GRA21) if results were greater than 0.5 g/t Au. The other portion of the pulp was sent to ALS Global laboratory in Vancouver for a multi-elemental analysis by aqua-regia and spectroscopy (ICP-AES/MS). Sample with assays higher than 1% Cu were reanalyzed by atomic absorption (CU-AA46) at the ALS Global Vancouver laboratory. Quality controls include systematic addition of blank samples and certified gold standards to each batch sample sent to laboratories. Copper standards will be systematically included in future samples sent to the lab. The Corporation has not been able to independently verify the methodology and results from the historical work program within the property boundaries. However, management believes that the historical work program has been conducted in a professional manner and the quality of data and information produced from them are relevant. Copper equivalent grade (CuEq) is presented for information purposes only and is not indicative of management's opinion on the potential metallurgical recoveries or future commodity prices. CuEq grade including silver values is based on 100% metal recoveries, Cu price of 3$/lb and Ag price of 18 $/oz. Copper grade equivalent calculation. CuEq% = (Cu % + (Ag grade x Ag price))/(22.0462 x Cu price x 31.0135 g/t).